Here is a break down of main topics in each Old Testament book from http://www.carm.org and generally accepted opinions of their authors and dates written from http://www.religioustolerance.org. 1. Genesis - Creation, the Fall, the Flood, spread of the nations, Abraham, Isaac, Jacob, and Joseph. Enslavement in Egypt. It is believed that Moses wrote all of the Pentateuch, except for Deuteronomy 34, which describes his own death and burial. Moses is believed to have written the books after the Israelite's exodus from Egypt, but before they entered Canaan. This would date the writing to the 40 year period when the Israelites were wandering through the desert, circa 1450 BCE. 3. Leviticus - Instructions on sacrificial system and the priesthood. Instructions on moral purity. 4. Numbers - Still at Mt. Sinai, people make false idol, punishment, 40 years wandering begins. 5. Deuteronomy - Moses' discourses on God's Acts for Israel the Decalogue, the ceremonial, civil, and social Laws, and covenant ratification. 1. Joshua - First half of Joshua describes the 7-year conquest of the Land of Promise. The last half deals with partitioning the lands to the people. Written by Joshua circa 1430 BCE. 2. Judges - Time of Judges. This was a bad time period. The Israelites did not drive out all the inhabitants of Canaan and began to take part in their idolatry. 7 cycles of foreign oppression, repentance, and deliverance. In the end, the people failed to learn their lesson. Written by the prophet Samuel, circa 1000 BCE. 3. Ruth - Kinsman redeemer in Boaz, redeeming Ruth, a Moabitess. Speaks of righteousness, love, and faithfulness to the Lord. Written by the prophet Samuel, circa 1000 BCE. 1. First Samuel - Samuel carries Israel from judges to King Saul. Originally 1 & 2 Samuel and 1 & 2 Kings formed one large book. Samuel 1 to 24 was written by the prophet Samuel, circa 975 BCE. The rest of the two books were written by Nathan and Gad, friends of David. 2. Second Samuel - David as King, adultery, and murder. 3. First Kings - Solomon, Israel is powerful. Solomon dies, then division of tribes: 10 to the north and 2 to the south. 4. Second Kings - The Divided Kingdom. All 19 kings of Israel were bad; therefore, captivity in Assyria (722 B.C.). In Judah, 8 of 20 rulers were good but went into exile too. 5. First Chronicles - A recounting of the history of Israel to the time of Solomon. 1 & 2 Chronicles were written by Ezra, some time after 450 BCE. 6. Second Chronicles - continued recounting of the life of Solomon, building of temple, to the captivity. History of Judah only. The Next 3 books deal with Israel's Restoration. 1. Ezra - Cyrus let most of the Jews return to their land of Israel. Zerubbabel led the people (539 B.C.). Ezra returned later with more Jews (458 B.C.) Built the temple. Written by Ezra about 450 BCE. 2. Nehemiah - Building the walls of Jerusalem. Nehemiah got permission from the king of Persia to rebuild the walls (444 B.C.). Revival in the land. written by Nehemiah about 425 BCE. 3. Esther - Took place during chapters 6 and 7 of Ezra. Mordecai. Plot to kill the Jewish people. Authorship unknown; perhaps written about 475 BCE. 1. Job - a righteous man tested by God. Deals with God's sovereignty. Job probably lived some time after the Flood and before Moses. The book was written perhaps at the time of Solomon, by an unknown author. 2. Psalms - This book contains 150 psalms which form the hymnal of Israel divided into 5 categories. The word "psalm" means "praise". At least 73 were written by David, 12 by Asaph (a musician in David's court), 10 by the "Sons of Korah;" 2 by Solomon; 1 each by Ethan, Heman and Moses. Most were written in the hundred years following 1030 BCE. 3. Proverbs - Practical wisdom in everyday affairs. Most were written by Solomon circa 950 BCE. Proverb 30 was written by Agur and 31 authored by King Lemuel. 4. Ecclesiastes - All is vanity. The wisdom of man is futility. Written by King Solomon. It seems to have been written shortly before his death in 931 BCE. 5. Song of Solomon - A song between Solomon and his Shulammite bride, displaying the love between a man and a woman. Written by King Solomon probably early in his reign, circa 960 BCE. 1. Isaiah - Looks at the sin of Judah and proclaims God's judgment. Hezekiah. Coming restoration and blessing. Written by Isaiah about 740 BCE. 2. Jeremiah - Called by God to proclaim the news of judgment to Judah, which came. God establishes a New Covenant. Written by Jeremiah from 626 to 586 BCE. 3. Lamentations - 5 lament poems. Description of defeat and fall of Jerusalem to the Babylonians. Written by Jeremiah circa 586 BCE. 4. Ezekiel - He ministered to the Jews in Captivity in Babylon. Description of the end of times. Written by Ezekiel near the end of his ministry, circa 570 BCE when he was living in exile in Babylonia. 6. Hosea - Story of Hosea and his unfaithful wife, Gomer. Represents God's love and faithfulness and Israel's spiritual adultery. Israel will be judged and restored. Written by Hosea circa 750 BC. 7. Joel - Proclaims a terrifying future using the imagery of locusts. Judgment will come but blessing will follow. written by Joel circa 830 BCE. 8. Amos - He warned Israel of its coming judgment. Israel rejects God's warning. Written by Amos circa 760 BCE. 9. Obadiah - A proclamation against Edom, a neighboring nation of Israel that gloated over Jerusalem's judgments. Prophecy of its utter destruction. Written by Obadiah about the time of a siege of Jerusalem, ca 845 BCE. 10. Jonah - Jonah proclaims a coming judgment upon Nineveh's people. But they repented and judgment was spared. Written by the prophet Jonah about 780 BCE. 11. Micah - Description of the complete moral decay in all levels of Israel. God will judge but will forgive and restore. Written by the prophet Michah about 735 BCE. 12. Nahum - Nineveh has gone into apostasy (approx. 125 years after Jonah) and will be destroyed. Written by Nahum about 650 BCE. 13. Habakkuk - Near the end of the kingdom of Judah, Habakkuk asks God why He is not dealing with Judah's sins. God says He will use the Babylonians. Habakkuk asks how God can use a nation that is even worse than Judah. Written by Habakkuk about 609 BCE. 14. Zephaniah - The theme is developed of the Day of the Lord and His judgment with a coming blessing. Judah will not repent, except for a remnant, which will be restored. Written by Zephaniah circa 635 BCE. 15. Haggai - The people failed to put God first, by building their houses before they finished God's temple. Therefore, they had no prosperity. Written by Haggai in 520 BCE. 16. Zechariah - Zechariah encourages the Jews to complete the temple. Many messianic prophecies. Written by Zechariah in the time span 520 to 518. 17. Malachi. - God's people are lax in their duty to God. Growing distant from God. Moral compromise. Proclamation of coming judgment. Malachi wrote most of this book circa 450 BCE. 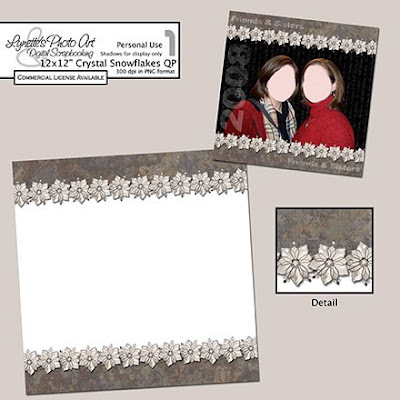 Today's freebie is a 12x12" QP made with my Crystal Snowflake that I gave you yesterday. The day before I gave you a beautiful 12x12" frame made with them too, so if you've missed any, you'll find them in the archives. The frame won't be available too long though as the file is large and I'm filling up my 4shared space. The snowflakes on this QP are opaque, not transparent like the first two gifts. The preview doesn't do it justice. Beautiful freebie, thank you, and especiall appreciation for the Bible teaching lessons. I appreciate your clarity and your willingness to be a vessel.